An important shipyard is always looking for and adopting solutions that better the industrialization process, with the aim of improving productivity as well as of refining as much as possible the quality standards of shipbuilding and design and, least but not last, of reducing at the most the impact of the production processes on the operators and the environment. The Avigliana yard followed this path with the new 40'and is expected to build one hundred units per year. 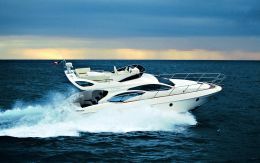 This result will be obtained thanks to the special hot rolling system acquired after a two-year research and which will also be used in the next years for larger yachts of the same range. 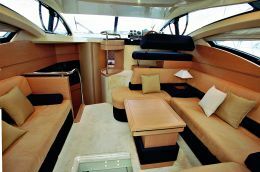 The Azimut 40', like the other yachts, was designed by Stefano Righini, who chose to increase inner space by "squaring off" the bow. 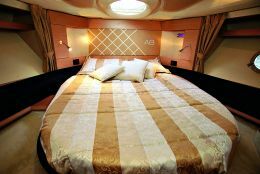 This expedient, hardly noticeable when looking at the photographs,moves the yacht's habitative baricenter towards the bow, greatly increasing spaces inside as well as on deck and on the flying bridge as compared with what one would normally expect to find on yachts of this size. Interiors, designed by Carlo Galeazzi in cooperation with the Azimut styling department, are bright and young, thanks to the ample windows and to the use of light-hued woods and textiles. Even the engines mark a turning point: it is the first time that the new highly efficient 380hp Common Rail Cummins are installed, offering reduced consumption and gas emissions in compliance with the relevant IMO rules. 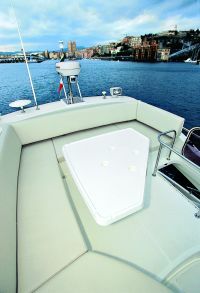 Not only we appreciated the fine interiors, but we also tested the seaworthiness of the hull in the waters facing Savona - one of Azimut bases. We sailed in the wake of a larger mother yacht and in such simulated waves the 40' showed good seakeeping ability and maneuverability. Draft from lower tip of propellers: 2'6"
Full boat displacement: 34,361 lbs. 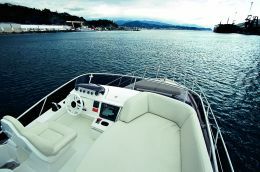 Price with standard equipment and test boat power: Euro 375,000.00 (VAT excluded). Fuel consumption data indicated in the graph were supplied directly by the yard on the basis of the sea trials. 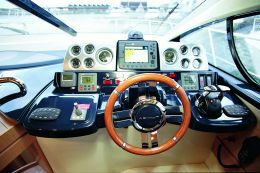 Fuel consumption may differ from published data depending on the weights loaded and their position on board, on the yacht's operating conditions, on the state of the engines and on their performance as well as on the characteristics of the propellers installed. 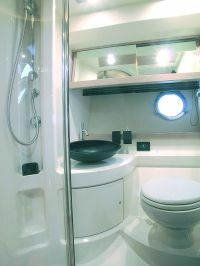 Helm station: ample, with armchair and dashboard fitted with all engine instruments and navigation equipment; forward of the helm station there is the sunning area and aft there is a U- shaped table; a windscreen with stainless steel structure quite efficiently protects from watersprays; the watertight loudspeakers are controlled from the salon. 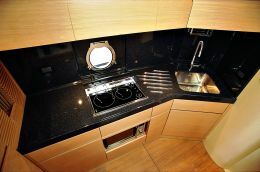 Galley: two ceramic hobs, stainless steel sink, granulon worktop, combined microwave oven, freezer and refrigerator, several lockers and extractor. 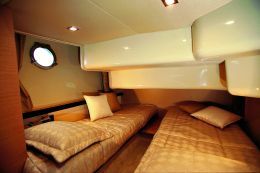 Optional fittings: tropical air conditioning; 13-kW generator; winecooler; running lights; 9-foot long gangway; convertible sofa in salon; refrigerator in cockpit; steerable electrical light; CD player in salon, owner and VIP staterooms; bow thruster; cockpit folding table; 20" TV set in salon; DVD player in salon and owner stateroom; 15" portable TV set; C80 Raymarine in helm station; C120 Raymarine on the flybridge; reading lamp in salon; exclusive decoration. 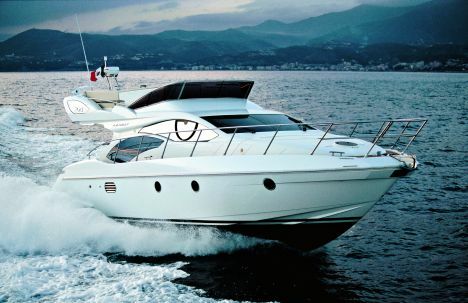 Cruising speed at 2,700 rpm's: 27 knots. Electrical switchboard and plants: 220V and 24V plants; 220V/3.5 kW standard generator, dockside electric connection, 24V/150Ah service batteries, 24V/75Ah battery for engine starting, 24V/50A electronic battery charger and 12V/10A for the generator. The main panels are fitted in the engine room (power panel) and in a compartment on the side of the dashboard (circuit breaker).